Traditionally, Mongolian life has been based around herding, with nomadic families sleeping in yurts and tending livestock. 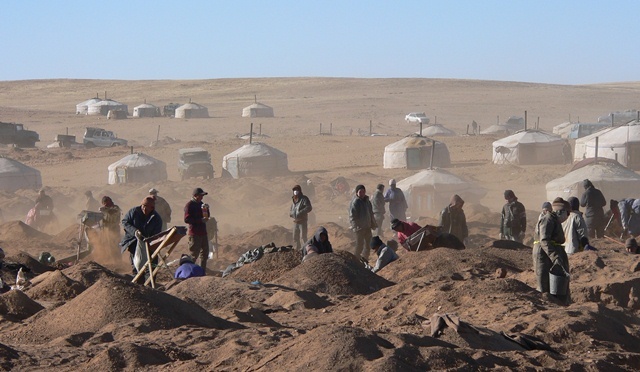 That’s why it’s surprising to hear stories like that of Khorloo, a 65-year-old Mongolian who spends her days digging through the Mongolian steppe with metal detectors and shovels, plucking out the occasional gold nugget after days of scratching in the dirt. A former economic underdog, Mongolia is now the world’s fifth fastest-growing economy, with an 12.3 percent GDP growth rate that would make today’s anemic, Western economies salivate. (For comparison, the U.S. economy is growing at 1.7 percent.) Like many other Central Asian countries, Mongolia is growing rich from selling minerals to China. According to a report by the Associated Press, Mongolia sends 90 percent of its exports to Chinese markets, and the two-way trade with Beijing makes up 75 percent of Mongolia’s economy. 1. The Ninjas: Though they sound like some sort of ore-hunting SWAT team, the herders who have recently sought their fortunes in freelance mining are actually a bit of a drag on the mining economy. Not only do they not pay taxes, notes Morris Rossabi in Foreign Affairs, they also contribute to prostitution, gambling, and other illegal activities. And the herders who have resisted mining complain that mining companies have undermined their way of life, forcing them to migrate. 2. Becoming too dependent on China: Because China has fueled so much of Mongolia’s growth, there could be scary repercussions as China’s economy slows. China’s demand for Mongolian minerals has already slumped somewhat, and most analysts say Mongolia needs to diversify its economy away from just one main trading partner. Granted, Mongolia has pushed back against Chinese influence, even going so far as to lay railroad tracks at a gauge that makes it impossible for them to connect to Chinese rails. China and Russia are now each limited to a third of Mongolia’s total foreign investment, and Mongolia has been attempting to foster partnerships with the United States, the European Union and Japan in order to hedge against Beijing and Moscow. 3. Its mines have been plagued by problems: Mongolia’s “resource nationalists” have made it difficult for mining projects to get off the ground. Nationalist policymakers worried about foreign influence over Mongolia’s resources want to amend the agreement on Oyu Tolgoi, a massive copper mine, so that Mongolia gets a bigger share. Last week, Rio Tinto Group, a British-Australian mining giant that owns the majority stake in the project, said it was considering a temporary halt to construction work at Oyu Tolgoi because of Mongolia’s demands for a larger share. 4. Mongolia is still pretty corrupt: Transparency International ranks Mongolia as 80th most corrupt of 182 countries — not as bad as 62nd most corrupt in 2011, but still not great. Inequality is on the rise, and it’s hard to tackle because independent groups suspect the government is falsifying the country’s true poverty numbers (which are already astonishingly high, at somewhere between 29 to 39 percent), Rossabi points out. Either way, this is hardly the sort of environment where dramatic, sudden economic growth can be expected to improve quality of life for most citizens.